As I moved into another month and aimed to continue with the year of microadventure, April revealed itself to be a month of high motivation, challenging weather and regular frustration as I wrestled various factors that seemed to repeatedly scatter my best laid plans. After not getting out in March until late in the month April arrived quickly. I had originally planned to head down to South Wicklow early in the month to explore the mountains and find a bivi spot but was forced to cancel last minute when work commitments changed. Undeterred and with plenty of time left I made plans with a friend to meet after work and head into the hills of North Wicklow. In the build up to the trip I was working in the hills for the two days prior. 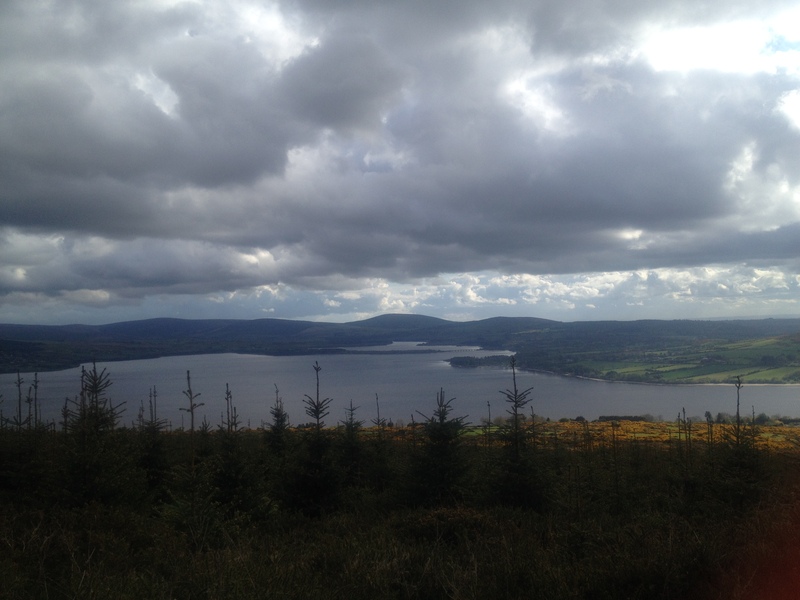 Day one was the best day in the Hills I have had since moving to Ireland. The weather was wonderful, close to 20 degrees at times. 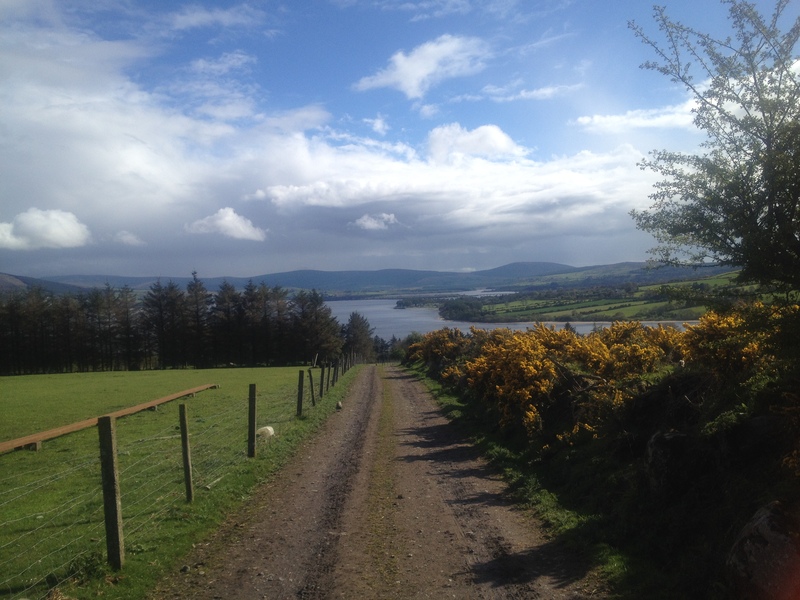 The views were stunning and the scenery around Lough Dan was inspiring. I was working with a wonderful group of young people who were enjoying themselves and engaging well with the environment. Within twenty four hours I was back in the hills the weather had turned, the rain had set in and the environment was completely unrecognisable from the day before. By day three, the day of the trip, the rain had turned to snow. It was a helpful reminder of how the mountain weather can change in a moment and the importance of making good decisions. The trip was off for another week. Plan three was quick to be formed and one week later my wife had agreed to join me and we planned to head out on the Saturday evening of the bank holiday weekend. Again the build up was good the weather fine and motivation high. Then came Saturday, heavy rain with weather warnings for wind and rain issued. Whilst my wife is a great support to me and loves the outdoor herself, without a huge amount of bivi experience, I felt this was possibly not the night for her to build on this. Being the bank holiday I wasn’t optimistic any of the local huts would be free so I decided we would side with caution and wait for a more favorable day. At this point I would admit that I thought April may pass me by. In a moment of frustration I even found myself questioning if I would continue with the challenge or if it was unrealistic given the nature of self-employment and a busy life. I quickly banished these thoughts and excepted that while once a month sounds easy in January there will be times where this will be hard to achieve, if it wasn’t I would surely have been getting out for twelve nights a year already, right? 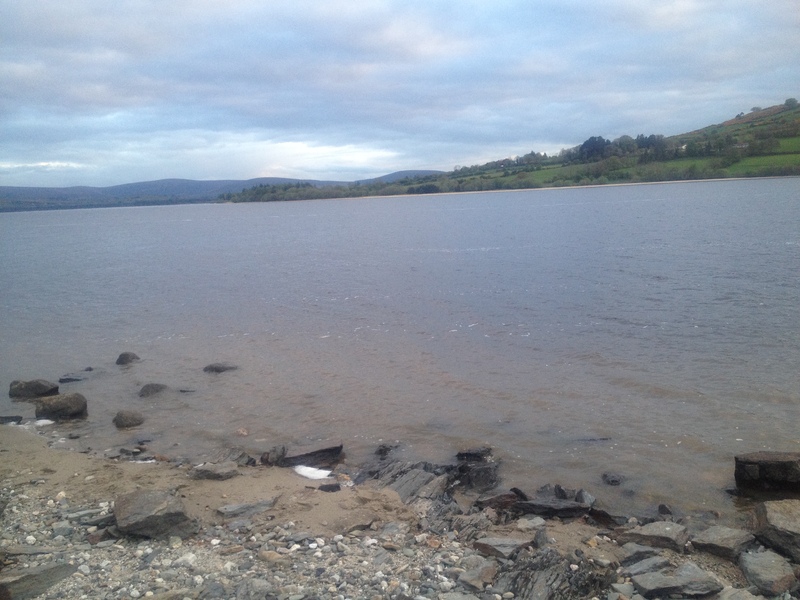 The only other opportunity I could see in the diary was filled by a commitment to lead an overnight expedition with a group of young people working towards there Bronze Gaisce award. Whilst these trips are fun they are also full of hard work and responsibility. I started to think of different blog posts and approaches to writing in a attempt to convince myself that I could somehow justify camping on a campsite with 60 young people would count. Whilst in many ways this would fit well with the ethos of the challenge as it is a night away and being shared with many others I couldn’t help but feel the reason I accepted the challenge in the first place was to allow me to enjoy the outdoor environment away from my work. At half past ten the time was right to act upon a plan I had been quietly forming through the evening. My responsibilities were complete and other staff had now taken responsibly for the young people for the rest of the night. Instead of pitching my tent alongside the other staff tents I grabbed my bivi bag and headed for the far corner of the field. I hopped over the wall and was now on the lakeshore, a nice mix of gravel and sandy beach that felt a million miles away from the busyness of the day. 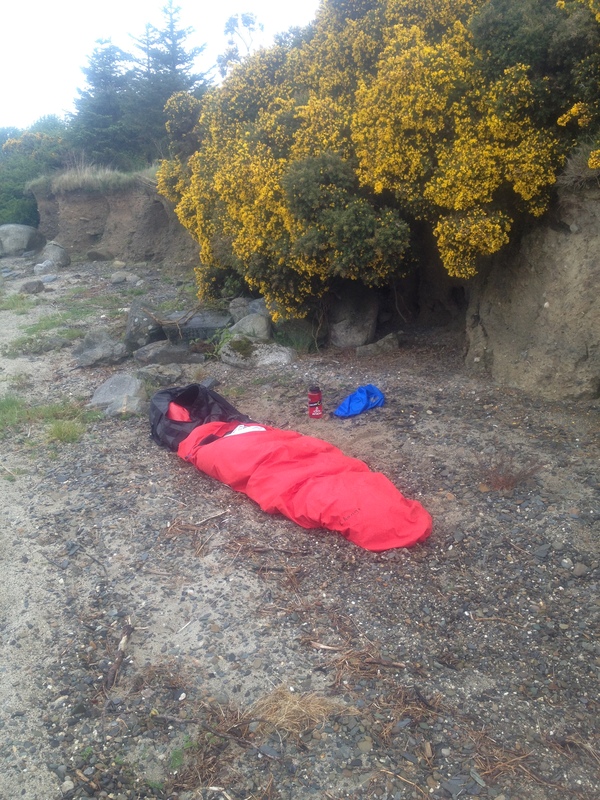 I walked a short way along the beach and found a flat area just the size I needed for a comfortable nights sleep. I pulled out my sleeping bag, climbed in and was immediately greeted by a feeling of relaxation and joy. The contrast of the busy day and large group of people made me appreciate all the more the stolen night I had managed to find and as I laid in my sleeping bag listening to the quiet lapping of the water nearby I knew I had made a good choice. I lay there feeling the cool breeze on my face and soon drifted off to sleep. I awoke from a deep sleep at around 2am. I knew there was a strong chance of rain given the changeable weather throughout the day. The clouds had been true to form and I was being treated to a few drops that were making it through my vent which had awoken me. I have camped a lot and have bivied in the rain under a trap before but this was the first time I had taken on the challenge of rain with just my bivi bag. I zipped my vent closed, and noted how refreshed I already felt even after only a few hours sleep. I was surprised at how comfortable I was and how the claustrophobic nature of the bivi bag did not bother me. I lay there listening to the patter of rain on the outside of my bag and soon drifted back to sleep. I awoke some hours later to my alarm sounding. 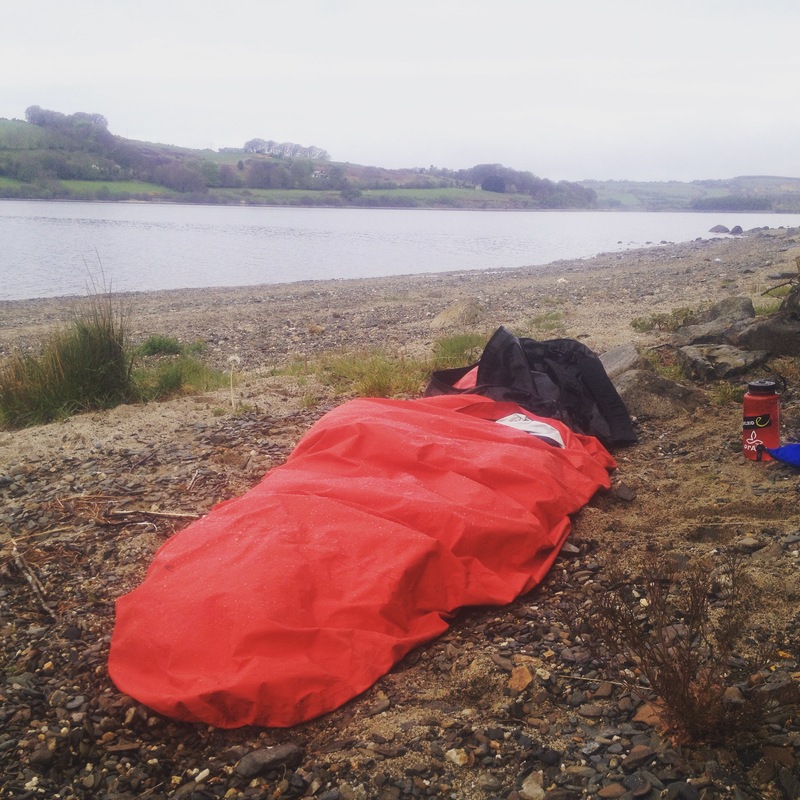 It was clear it had turned into a heavy night of rain, the beach was very wet all around me and there was a lot of water gathered on my bivi and bag that I had been using as a pillow. I was warm and well rested though and after grabbing a few quick photos to document the event it was time to start the day. Upon getting out of my bed I found some water had in fact made it into my bivi, my sleeping mat was wet and sleeping bag damp but not enough to have caused concern in the night. I also discovered the bag I thought would have been water resistant enough to survive the night had not done so and such the contents was now rather wet. It seems like I still have a few lesson’s to learn before mastering Bivi’s in the rain. I jumped back over the wall and was soon back with the group serving breakfast to the young people and helping them pack up camp pleased in the knowledge I had stolen a microadventure back from my busyness and felt all better for it.